I have a huge shoe problem…if one can even call THAT a problem…! I love, love my shoe collection. which at this point, reaches the top of my closet. I love that I forget the shoes that I own! what a happy surprise when I discover a pair that I have not seen in five years! all my shoes are in their original boxes…and organized by style: boots, work shoes, summer shoes, Uggs, flats, clogs, Crocs, going out shoes (my faves! ), casual shoes, crocs, tennie’s…the list goes on. once in a while, I send them tumbling while deftly attempting to sneak out a box from a lower level. laughing as it starts raining shoes! my hub finds my obsession amusing. whatever makes you happy baby, is his usual reply when I sheepishly explain that I came home with four pairs of new shoes. all on sale! I happily sing. 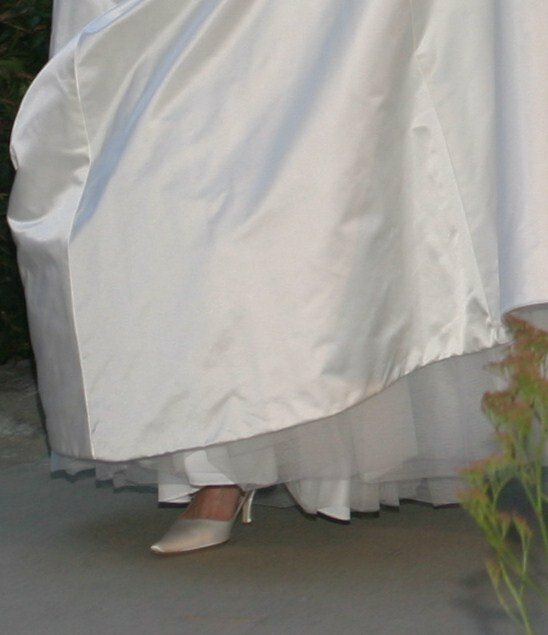 favorite shoes of all time: my wedding shoes. they are beautiful. and in a safe spot to prevent a tumbling incident. once a year, I pull them out, just to admire the smooth, silky opalescent lines…perfect pointy toes…three inch heels…leather soles. I love, love them. and what a steal! they were marked off 60% at Zappos.com! for Vera Wang that is amazing! oh, if I could run a Zappos call center, I would be in utter heaven! Tony Hsieh knows what he’s doing. even though I have a tendency to walk a bit wonky …at least I do it in style! how do you treat yourself? I would love to hear! This entry was posted in 2012 and tagged happiness, love, mind-body-soul, MS, shoes, Zappos by erin. Bookmark the permalink. LOL – I never knew you loved shoes so much – like Carrie in SATC! It’s funny you mention Zappos. They just took our management team to a tour of their headquarters in Vegas a few weeks ago and I was utterly in AWE of their operation. It was the coolest workplace I think I’ve ever step foot into… and the employees are definitely all drinking the kool-aid; they love it there! I was half tempted to ask for a job application myself – yet I think I would not make it past the first cut for not having the requisite number of tattoos, piercings, and wild hair colors. 🙂 Tony has definitely found a niche and is owning it – so awesome for him. lol! I think that’s where I got my love of shoes! that’s so cool. 🙂 I would love to take a tour…! !